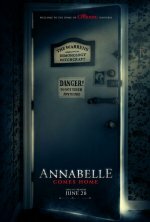 Determined to keep Annabelle from wreaking more havoc, demonologists Ed and Lorraine Warren bring the possessed doll to the locked artifacts room in their home, placing her “safely” behind sacred glass and enlisting a priest’s holy blessing. B... show all ut an unholy night of horror awaits as Annabelle awakens the evil spirits in the room, who all set their sights on a new target—the Warrens’ ten-year-old daughter, Judy, and her friends. The demonically possessed doll Annabelle has been placed by the Warrens in a location they believe she can no longer wreak havoc: their Artifacts Room. Soon the doll soon sets its sights on their 10-year-old daughter Judy (Mckenna Grace). The porcelain doll that is possessed by a demonic force returns in an untitled sequel.